For the 12th year in a row, the family and fellow highway patrol troopers held an annual Christmas toy drive to honor Corporal John “Jay” Sampietro at Cox South. Sampietro was killed on August 17th, 2005, while he was directing traffic on I-44 after a fatal crash earlier on the interstate. 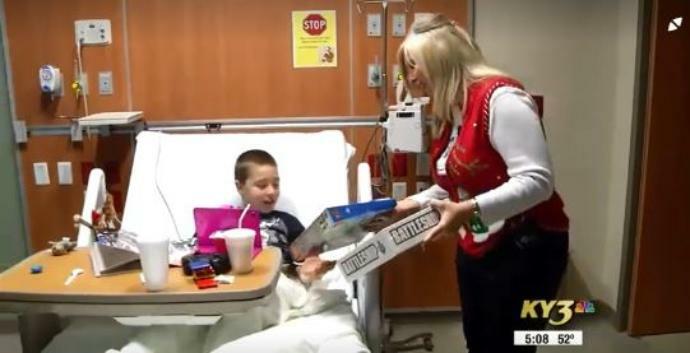 Sampietro’s widow Jennifer tells KY3 they delivered toys to 18 kids. But Wednesday was made even more special because of the dedication of a pediatrics room to be named after Jay. The Highway Patrol and the Sampietro family worked for two years to raise the money for the room dedication. But it was Jay’s former supervisor that came forward with a large donation that got them to their goal. “I got the news on mine and Jay’s anniversary. Which was November 13th that we were able to get the room and dedicate it to him, so that was a good day, it was a good anniversary.” Jennifer says, as she fought through tears. Jennifer says that is the perfect way to honor her late husband.